After a full season build up to the Vuelta a Espana, an ugly virus took me down. I lost 9 pounds in a week, but as soon as I was able I got back on the bike determined to give my best to finish the season well. Three hours into every ride I felt deep fatigue but I forced the miles and intervals knowing that the off-season was around the corner. Six weeks later, I’d been pushing some of my best power numbers in training and looked forward to racing after so much time on the sidelines. When the peloton is full of ragged riders after ten months of racing, motivation is a great asset. In the start Adrian jumped in a breakaway, for the next hour I helped block the road and cover counter attacks. The strongest riders wanted to create a race of attrition and used their teammates to keep the pace high. An ultra steep two km finishing climb awaited us in each of the five nine km finishing laps. The run in to the first circuit was extremely dangerous on a wide road. Our team got separated and I was in bad position the first lap. At the top of the climb I was a few meters behind the first group and latched on down the descent. I started the next two laps in the very front. Without prior course knowledge, I chose the wrong gears for the day. The second km of the climb was so steep that I had to grind inefficiently up the hill and slipped back through the shrinking front group. On the last lap the elastic snapped for good. Just 75 of the 190 or so starters finished the race. A less decisive climb in the ten finishing laps provided a more balanced race. Sprinters would have their chance if the peloton remained in tact and they survived the 1.5 km climb, but a group of opportunists could potentially spoil the party and break up the race. I hoped to take my chances in those late race attacks, but we also had Kristian to cover a sprint finish. 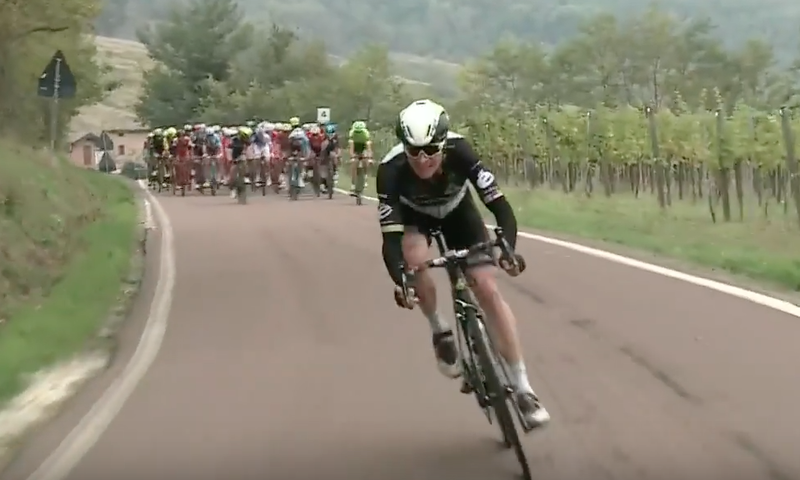 The breakaway came back with 60 km to go and the aggression started. With 40 km to go, I attacked on the climb. A few riders came with me. The surge split the peloton into three groups, but there was not enough emphasis to keep it going. Nic Dougall followed the next move which attracted the right mix of riders and it started to look dangerous. On the climb with 20 km to go, I turned myself inside out to follow the race favourites when they bridged the gap. I thought I’d made the winning selection, but the group was too big to work together. In the end Luis Leon Sanchez won solo just ahead of the peloton. 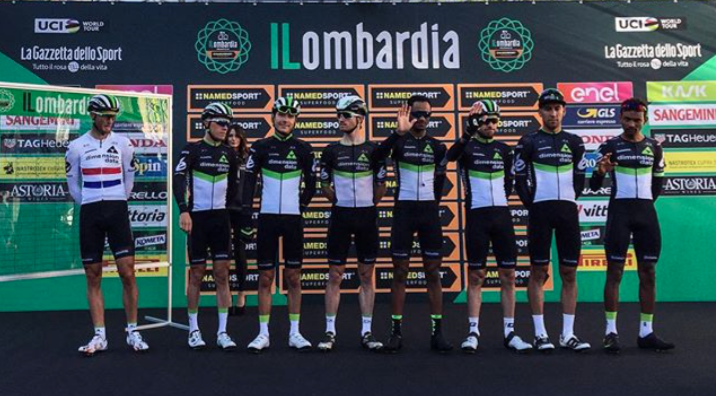 One week after promising performances in Emilia and Beghelli, I lined up for Lombardia, the final monument of the season. The classic is known for it's beautiful scenery and the fall colours around Lake Como as well as it’s incredibly difficult climbs. As I covered moves for the early breakaway, I could feel that something was off. It was going to be a difficult day. Jaques made the break, and I looked for ways to contribute to the team. Leading into the first selection point of the race, I linked up with our team leader. I battled with every other team to keep us at the front. It was sketchy business, and eventually I noticed that our leader was no longer with me. I drifted back to find him, but it was too late. A very technical descent split the peloton before the decisive climb. After a futile chase, we knew our day was over. Disappointed we hit the showers. After a season of ups and downs, I’m looking forward to some rest. The fitness I showed in Emilia and Beghelli gives me great hope for next season, but more than anything I’m looking forward to my own wedding this week! Until next season. Thank you for all of the support.